Here’s a scary thought: Are you your own worst enemy because of bad habits? So true! By doing a task (or thinking a thought) over and over again, it becomes ingrained in your very being. As a result, you no longer have to devote as much attention to it to get the thing done; you’ve freed up energy and attention for other activities, both physical and mental. In fact, you probably rarely take active notice of the fact that you’re doing the task or thinking the thought. That’s both the joy and the curse of habits. If you’re used to operating in a groove of productivity and effectiveness, your habitual ways of acting and thinking can help you cruise along that groove even more smoothly. Unfortunately, the reverse is also true: If you’re used to floundering in a sea of counterproductive actions and thoughts, the very fact that you’re in the habit of thinking and acting that way will keep dragging you down and will prevent you from getting the outcomes you want. So how do you go about changing your habits from hindering to empowering? Practice doing habitual activities in a new way, making sure that you start small. There are dozens of ways to do this: Take a new route to a favorite client’s office. Order something other than “the usual” at your favorite coffee shop. Put the toilet paper on the roll so that it comes over the top instead of from the bottom, or vice versa. (Cat owners are exempt from this one; I know that over-the-top TP is a recipe for major messes when cats are involved.) The point is this: If you get used to shifting small habits, you’ll build your tolerance for change and thus be willing and able to tackle bigger, more ingrained habits. Create a cue that will remind you of the new habit you’re going to create. If you’re susceptible to the lure of checking emails constantly, you might post a sticky note on your monitor: “Set aside 20 minutes at the top of each hour to check email!” On the personal front, you might put your running shoes next to your bed to help remind you of your decision to become a person who habitually runs first thing in the morning. Here’s another sticky note you can post: “Is this a knee-jerk reaction?” I find this reminder particularly helpful when it comes to interpersonal communications. Am I in the habit of expecting to get objections when I’m speaking to a prospective new client? Do I typically respond to a particular type of comment in a particular type of way? Get clear, down in your gut, on what the old, counterproductive habit is costing you. Look at mental and emotional costs as well as financial ones. Create a detailed picture, involving as many of your physical senses as possible, of how your life will be better and different once you’ve shifted over to your new success habit. Get real and get honest about whether you truly want to change, or are, in fact, unwilling to change. An example many of us can relate to: Until more people prefer being healthy to indulging their taste buds with junk food, America will continue to be an overweight-verging-on-obese country. Develop a support system. Since I’m one of those people who struggles to exercise by herself, I’ve enlisted my sister as an accountability buddy; we have an inviolable commitment to work out on Mondays and Thursdays. And since there are a whole lot of big scary activities facing me as I grow my business, I rely on the twice-monthly meetings with my Mastermind group to help me stay on track and act courageous even if I don’t feel that way. 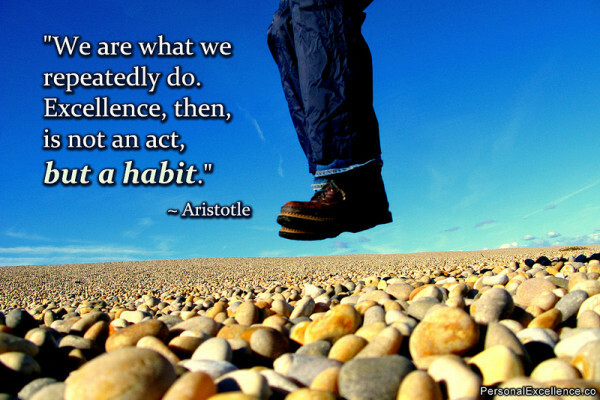 So…Where are your habits propelling you forward? Where are they chaining you to frustration and mediocre results? Where and when will you start to make sure all your habits are your best friends? This entry was posted in personal power, Uncategorized and tagged choice, commitment, focus. Bookmark the permalink. One Response to Here’s a scary thought: Are you your own worst enemy because of bad habits?